The deck house style saloon offers dining and relaxation in air-conditioned comfort with 360 degree views of your anchorage. Flat screen TV, Bose sound system and large chart table add to the enjoyment of this upper level area. 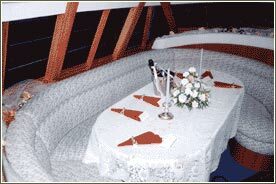 The dining table is on the same level as the cockpit and offers larger groups the opportunity to socialise with those in the cushioned cockpit area. The large dining table can seat 6 for full table service. Upholstered curved lounge provides comfortable cushioned seating in this area.